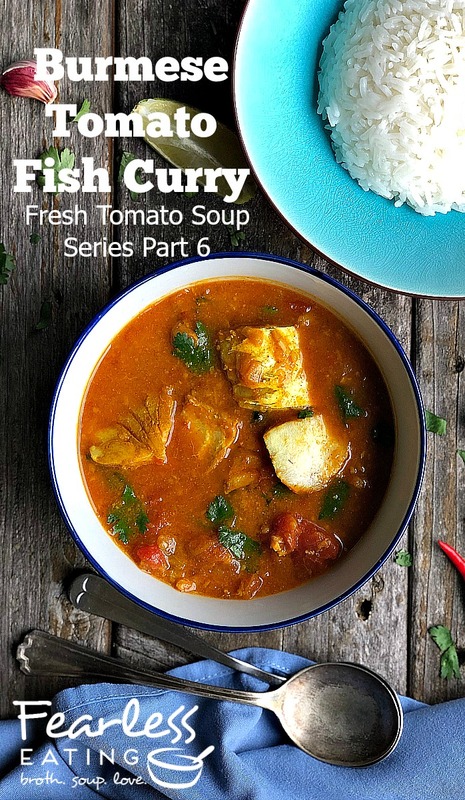 Welcome to the final installment of my 6-part fresh tomato soup series, a Burmese tomato fish curry! It combines my love of southeast Asian cuisine with another unique way to use fresh in-season tomatoes, the true purpose of this whole series. And so I’m turning to Burma, a country I fell in love with during my travels there in 2007. Burma (aka Myanmar) is a truly magical country. Golden shining temples dot every landscape with pointed stupas spiraling skyward, rising above city skylines, ancient forests and mist-shrouded hills, much link the monks in their bright orange robes dot everyday scenes of life. Like many Asian countries, Burma can be chaotic and crazy and yet there’s a palpable sense of softness and ease underneath it all. It’s hard to explain but as soon as I stepped off the plane, I felt my body relax and I had a strange sense that I had been there before. Even the cuisine felt familiar too. I immediately fell in love with mohinga, the national dish of Burma, a savory noodle soup of exquisite flavors, and still my all-time favorite meal EVER. Another favorite soup was a coconut chicken noodle soup. But you can’t go wrong with today’s soup for a Burmese tomato fish curry, which is more of a stew-like meal than a soup, but nonetheless a tantalizingly delicious blend of tomatoes, spices, herbs and vegetables. It’s a great example of what makes Burmese cuisine so interesting and distinct from the cuisine of it’s more well-known neighbors – China, India and Thailand. If I could overly generalize the differences in one sentence it would be that Burmese food is not as sweet and intensely spicy as those cuisines but is defined by more savory, salty and sour flavors. 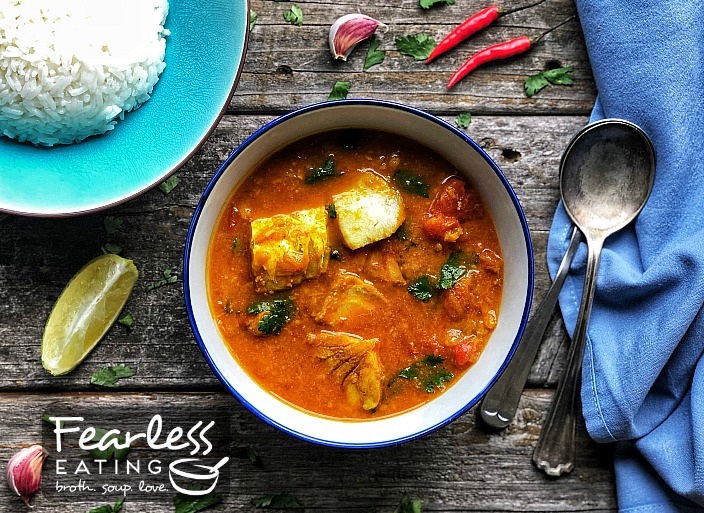 To learn to make a Burmese tomato fish curry, the full recipe details with exact ingredient amounts are in the printable recipe card at the bottom of this post. But first, let me highlight a few things about it for clarification purposes. As with all traditional foods, there’s no one right way to do things and you can make choices based on your personal preferences and what ingredients you can access. Step 1. Marinate the fish. Catfish is typically used in Burma but feel free to use another meaty white fish like cod, hake, haddock or snapper. I used pollock in this recipe. 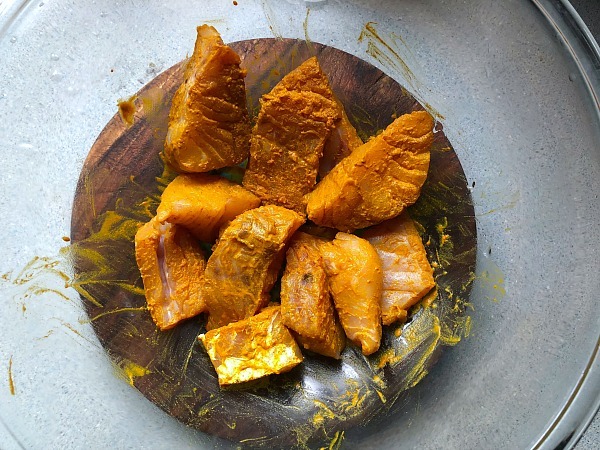 Cut your fish filet into chunks and marinate them in turmeric and fish sauce. Set it aside. 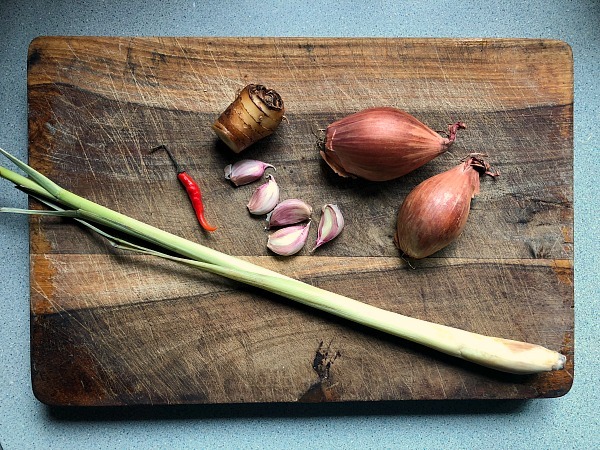 You’ll need one stalk of lemongrass, galangal or ginger, one to three red bird’s eye chiles, garlic and shallots. You’ll find all of these in Asian markets and even in some health food stores. The only exception is galangal but it’s fine to use ginger instead. Once removed, dice the stalk into small pieces and then dice the other ingredients too. 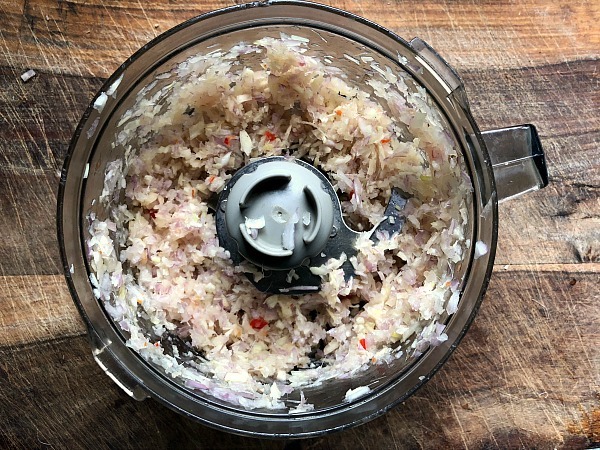 You don’t have to dice it too fine because you’ll be adding it to the food processor. A quick word about using bird’s eye chiles. They are fiery hot! Careful. Burmese cuisine isn’t quite as liberal in their use of chiles as Thai cuisine. I used just one red chile for the recipe below which will give it a mild level of heat and spice. Use two for a moderate level and three or more if you like it super hot and spicy. That’s good enough! It doesn’t need to be super smooth like a Thai curry paste. Step 3. Saute the curry paste in coconut oil and add shrimp paste. You only want to use a little! It has both an intense flavor and aroma. If you don’t want to use it you can add a little extra fish sauce later on when you’re seasoning the soup. Again, FRESH in-season tomatoes should be your first choice (remove the skin and seeds, if you have time). If not, substitute good quality organic canned tomatoes. If you don’t have a homemade fish broth, Bar Harbor fish broth is a good product. You can also use just water instead though fish broth is a better choice. Step 6. Add some chickpea flour. It’s also called “garbanzo bean” or “fava” flour and you’ll find it in health food stores. Bob’s Red Mill chickpea flour is a good choice. This is also optional and not a typical addition in a more authentic Burmese tomato fish curry. But my instincts told me to add it. I love the way it slightly thickens mohinga and I thought it worked wonderfully here too. 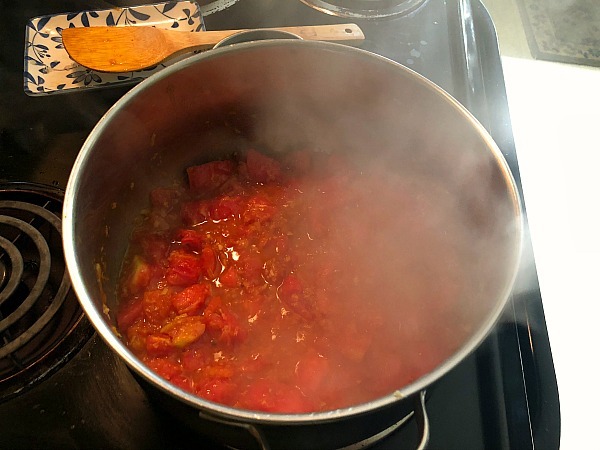 To prevent clumping, remove some of the curry (try to scoop up more of the liquid portion) to a separate bowl, add the chickpea flour and mix it well to dissolve it and then add it back to the main pot and stir it in thoroughly. The rest of the recipe comes together quite easily! Simply follow the full recipe below. Chop fish into bite sized chunks. Combine turmeric and fish sauce and mix with fish. Let marinate and set aside. 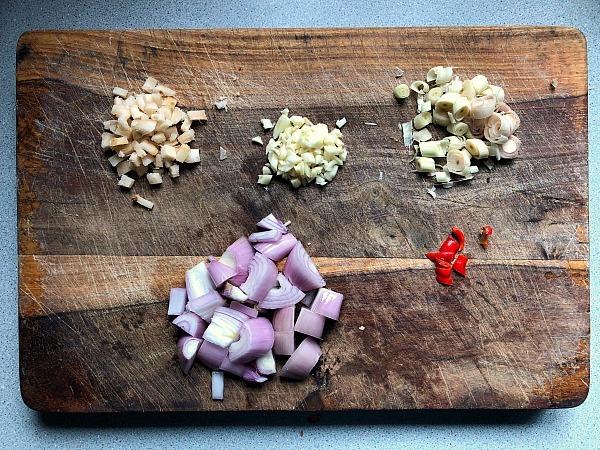 Chop all the ingredients for the curry paste, add to a food processor, blend into a rough mixture and set aside. It doesn't have to be super smooth like a Thai curry. 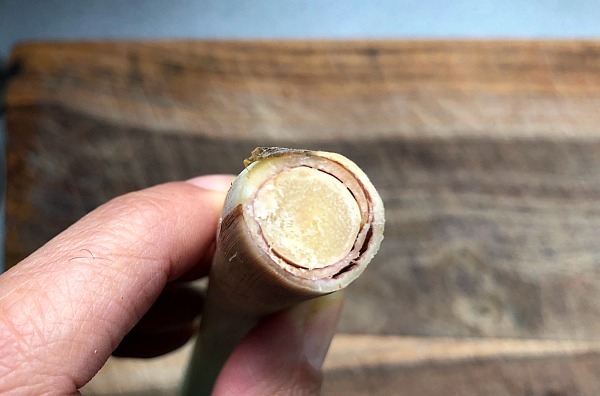 A chunkier texture is more common in Burmese cooking. Add oil over medium-low heat in a stockpot and add the curry paste. Saute for about 5 minutes until fragrant, stirring frequently, being careful not to burn. Add more oil if paste becomes too dry and starts to stick. Add optional shrimp paste and mix well for about one minute. Add turmeric and paprika and cook for another 30 seconds, stirring frequently. Add tomatoes, turn up heat and simmer for 10-15 minutes, stirring on occasion. Prepare rice while tomatoes are simmering. Add fish broth (or water) and simmer another 5 minutes. Scoop out a few cups of the broth into a separate mixing bowl and add the chickpea flour, stirring well until there are no lumps. Add it back to the soup and mix well to slightly thicken the soup. Add seasonings, to taste. Start with 1 TBSP fish sauce and add more, if needed. Determine if you'd prefer a little sweetness and/or sour flavor and add coconut palm sugar and/or lime juice. Add at least 2 TBSPs chopped cilantro, up to 4 TBSPs. You can reserve some of the cilantro garnishing individual bowls. Add fish chunks into soup and simmer gently for a few minutes. Turn off heat, cover and let the fish cook for about another 5 minutes. Ladle soup into individual bowls and add garnishes, to taste. Serve with steamed rice on the side. For the curry paste, add one Thai chile for a mild heat level, two for a moderate level and three or more if you like it super hot and spicy. 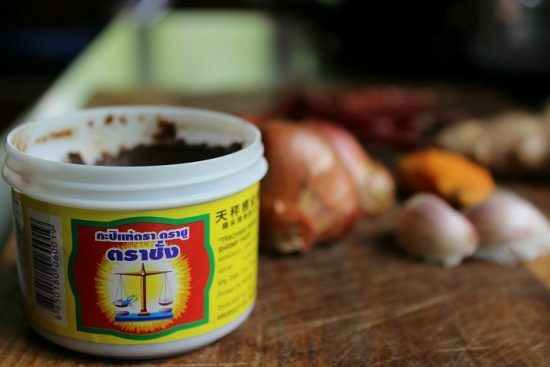 Shrimp paste can only be found in Asian food stores. It's not essential though it's a common ingredient in Burmese cooking. Sub a little extra fish sauce if you can't find it or don't want to use it. Chickpea (also called "fava") flour is also optional. It will slightly thicken the soup.